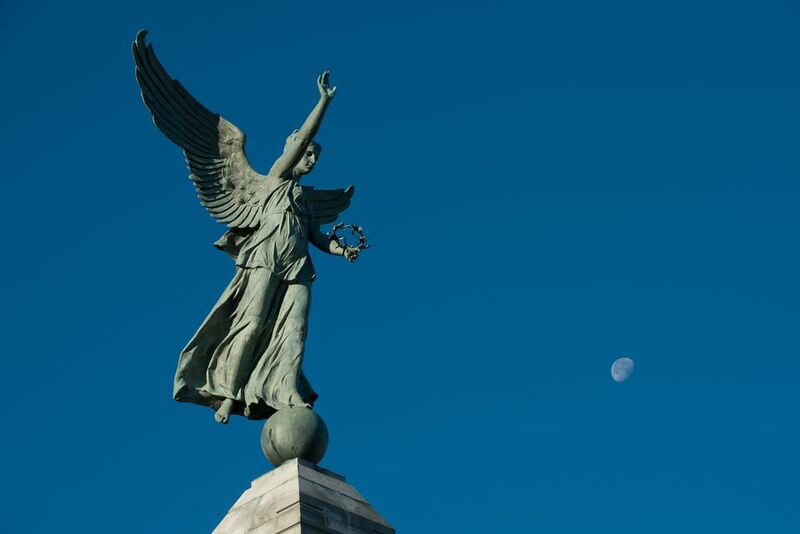 That gorgeous "angel statue" where tam tams and filmmakers collide on Montreal's almost-mountain, Mount Royal, in the heart of Parc Jeanne-Mance's west side, is called the Monument George-Étienne-Cartier. Erected in honor of a corporate lawyer by the same name, once secretary for the Société Saint-Jean-Baptiste and one of the fathers of the Canadian Confederation, the monument was originally unveiled in 1916, during World War I, then officially inaugurated three years later. And it's seasoned with symbolism, from the nine maidens at the base representing the nine provinces of Canada at the time to the four lions guarding Cartier's memory (one source claims they represent the British Empire) to a winged figure called La Renommée -French for "the renowned" or "the famed"- reaching to the heavens. A soldier waving a flag was added post-war, in 1919. Considered a champion of French Canadians by some, George-Étienne Cartier is also accused of treachery by others. A statement he made in 1858 during a presentation to Queen Victoria -"an inhabitant of Lower Canada (Quebec) is an Englishman who speaks French"- is an example of what's gotten him in hot water with some Quebecers, particularly Quebec separatists. So Was Cartier a French Quebec Traitor? Or a Strategic Patriot? It certainly is easy to assume Cartier is a traitor. But is it an accurate interpretation of Cartier's motives? Historians claim George-Étienne Cartier was responsible for persuading French Canada that they would stand a better chance of preserving their language, religion, institutions, and culture if they joined in the creation of a unified Canada. Cartier, a patriote who actively rebelled against British imperialism to the point of fleeing to the United States in 1838, faking his own death to save his life after being accused of treason by the British-ruled colonies, seemed particularly worried that French Canada would be no more if one of the Americans' repeated invasions were to succeed. Stating in an 1865 speech: "we must either have a confederation of British North America or else be absorbed by the American Confederation," Cartier seemed convinced that becoming a separate entity, the province of Quebec, within a unified alliance, Canada, would serve as better cultural protection for the French than fighting American expansionism on their own in the musical chairs government and unpredictable economic situation they lived in. Take the 11 Bus West from Mont-Royal Metro. Get off at the corner of Mont-Royal and Parc. Walk up Avenue du Parc in the direction of a large, conspicuous patch of rising green space (you can't miss it!) until you reach the angel statue near the corner of Parc and Rachel. Check out a map of the area. A different route that requires less walking involves the perpetually packed 80 Bus North from Place-des-Arts Metro. Get off at the corner of Parc and Rachel and simply cross Parc in the direction of the angel.